​Shelby Chapman calls the Southeastern side of the state, Richland, Iowa, home. She’s an Iowa State University graduate, having received a Bachelor’s Degree in Animal Science in December 2013. She is employed at TriOak Foods as a Swine Fieldman, overseeing TriOak pork producers, providing guidance and diagnostics on swine health and medication. Rodeo has played a large role in Shelby’s life. As a result, she has earned the title of Miss Dallas County Fair Rodeo Queen in 2008 and Miss Teen Rodeo Iowa in 2009. Most of Shelby’s free time is spent assisting the family crop, swine and cattle farm. When time allows, she enjoys photography, exercising, baking and spending time with family and friends. Shelby is honored to earn the title of Miss Rodeo Iowa. As Miss Rodeo Iowa, she will travel approximately 30K miles both in and out of the state. Through her travels she will focus on promoting Iowa agricultural, rodeo & educational opportunities for young women. During her reign she will attend rodeos, fairs and parades, as well as visit schools, hospitals and the elderly. Shelby will conduct radio, television and newspaper interviews across the nation. In December of 2016, she will represent Iowa at the Miss Rodeo America Pageant in Las Vegas, NV. 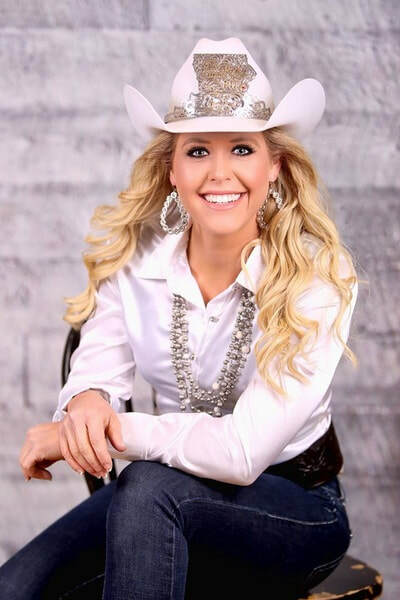 During this pageant, Shelby will have the opportunity to vie for the coveted Miss Rodeo America title along with over $100,000 in educational scholarships and other awards.